Featuring selections from the FAC’s Native American and Spanish Colonial collections, this exhibition explores the many ways that objects tell stories. Stories explored through the objects include – morals, lives of the saints, origins, commodification and trade, collecting practices, cultural contact, disruption and destruction. This will be an interactive exhibition, wherein Colorado College faculty, students, community members, artists and visitors are invited to share additional stories about or inspired by the objects. Additional texts, videos or audio contributions will be archived and variously incorporated into the exhibition or made available through technology. 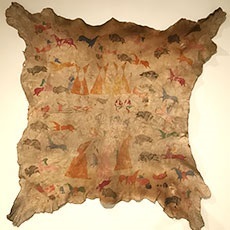 Tour special exhibition, The Art of Storytelling, led by guest curator Karin Larkin, Assistant Professor in the Department of Anthropology at UCCS. Learn about what went into creating the exhibit and the objects themselves, which feature selections from the FAC’s Native American and Spanish Colonial collections. No RSVP required, check-in at front desk.